Would you wear this colour? Did it last long or did you have to reapply often? Absolutely! 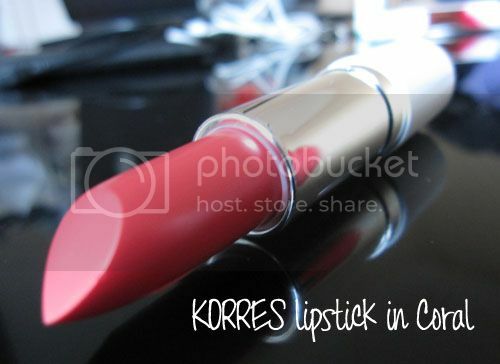 I love Korres' products, and have been considering getting one of their lippies. This color, along with Natural Pink, is very pretty! How are your eyes? Since you don't have to wear contacts now, have the tiny eyelid bumps gone away? this is such a pretty coral lippie!! looks good on your lips! I've been so curious about the Korres brand... is it worth the price??? I wanna give them a shot... let me know how you like them & what items do you recommend? thanks! btw, love your blog!!! that colour is gorgeous on you! Princesa Livia this is my first time in your blog and I already love everything about it! Great Swatches and reviews by the way! 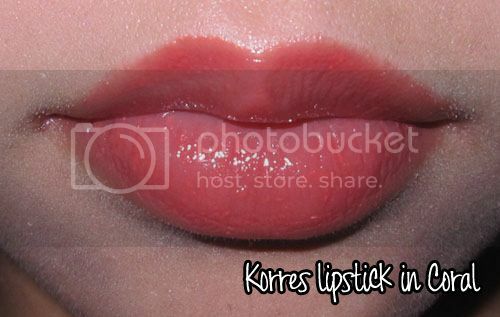 I do have one question though: do you know if is there a similar color to this Korres lipstick in MAC?